It’s going to be a ceremonious autumn in Germany this year as the country readies to celebrate 25 Years since the Fall of the Berlin Wall. On Nov. 9 Berlin artist Christoph Bauder will light 10,000 balloons marking the 7.5 miles along the Wall’s former location in Berlin and that’s just one of a series of special events and museum exhibitions that will happen throughout the city, focusing on the division of Germany and Berlin, the Cold War, and the peaceful revolution leading to reunification. Berlin has become such a joyous town, going from the Iron Curtain city to the “new Barcelona,” over the last 25 years. It’s probably difficult for younger travelers to comprehend that the Berlin Wall was once more than an easel for graffiti. The Wall brutally severed streets, squares, rivers and canals, ripping families and friends apart. Military activities on both sides of the Wall meant there had to be space on each side of the Wall for border troops. This created a vast scar across the city, an empty living no man’s land that ranged from 30 to 500 yards across. Director Wim Wenders captured the melancholy of the place in his film Wings of Desire. The German National Tourist Board (GNTB) knows it has an important story to tell and it just announced it will tell it in more than one medium. The GNTB’s new “My summer holiday in Germany — 25 years after the fall of the wall" campaign will use social media that hosts specifically created videos by video blogger Mike Corey and Caspar Diederik, plus a global photographic contest on Instagram. "Videos and the associated video marketing are an essential part of our online marketing strategy,” said Petra Hedorfer, the GNTB CEO. The series of three-minute films will demonstrate the changes over the last 25 years to such places as Dresden Frauenkirche, the Bauhaus sites in Dessau and Weimar, the Zollverein Coal Mine Industrial Complex and the Nebra Sky Disc in Saxony-Anhalt. The Instagram photo contest is searching for the best pictures under the theme: "My summer holiday in Germany — 25 years after the fall of the wall" effective immediately until mid-August. Travelers to Germany can tag and upload these using #germany25reunified on Facebook and Instagram. A first prize of a round-trip flight to Berlin with two nights at Hotel Lindner at Kurfürstendamm, will be present to the winner by the GNTB. It’s a good thing that the GNTB is seeking ways to tell this story to younger generations. Today a band of bricks runs through Potsdamer Platz marking the path that the Wall cut through the middle of Berlin. When you walk along the edge of the Tiergarten on Ebert Street, it’s easy to miss the row of crosses with the names of people shot by East German border guards as they tried to scale the Wall. Happily, that vast scar of a no man’s land has been reclaimed and areas like Potsdamer Platz, once empty except for the suspicious gaze of policemen and soldiers is now a garden of modern architecture. Such star architects as Renzo Piano and Hans Kollhoff were part of a massive building effort that left the corporate headquarters of Deutsche Bahn, a shopping center, the Film Museum, several cinemas, theatres, hotels and restaurants as well as the Sony Center with its trademark tent roof. Now Potsdamer Platz is one of Berlin’s cultural centers. Soon, Leipziger Platz, across from Potsdamer Platz, will open the Mall of Berlin, probably in September. Other parts of the Wall ran along the Spree River, now a scene in summer where artificial Caribbean style beaches are created, not for swimming, but for drinking cocktails and strutting bikini bods. The Friedrichshain-Kreuzberg district, which were once separated by the Spree River Wall are now attracting visitors to the East Side Gallery, or the still standing Wall with its East facing side painted by more than a hundred artists from all over the world. The symbol of hatred and division was turned into a 1,300-meter-long work of art that is now a favorite shot for photographers. Even one of the guard towers is now a night club called White Trash. Brandenburg Gate has re-emerged from its tenure as part of the Wall to once again being what it was meant to be the gateway between Eastern and Western Europe. When you head to Berlin you can find countless ways to experience the incredible modern history of the city and its awful Wall. There are attractions and museums that explore the Nazi years, the Stasi years, the espionage battles between the KGB and the Cia, the Wall and more. You can download a GPS-guided walking tour on the trail of the Berlin Wall, guided or self-guided bicycle tours on the Wall path, visits to underground Berlin, former watch towers, Wall memorials, The GDR Museum, or a drive into the East of the city in an original GDR Trabant car. Kensington Tours created a Fall Of The Berlin Wall 25th Anniversary itinerary. The tour will explore everything from Prussian kings and the Third Reich to the Cold War and the city’s reemergence. The tour visits tour Checkpoint Charlie, Brandenburg Gate, The Reichstag, Berliner Dom, Hitler’s bunker, a Jewish synagogue and the Berlin War Memorial. Priced at $2,770 pp for 5 days, this trip is can be customized to suit any travelers’ style, schedule and budget. The crowds kept growing, Monday by Monday, until by 1989 the crowds were huge and Oct. 9 of that year they reached 70,000 and then 150,000 on Oct. 16 and on the third consecutive Monday of Oct. 23 the crowds reached 300,000. 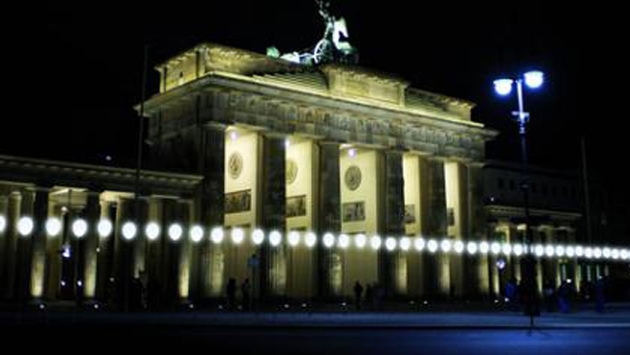 The Monday Demonstrations, which led to the fall of the Berlin Wall and paved the way for German reunification on October 3, 1990, are commemorated annually in the city’s Festival of Lights every Oct. 9 and this year’s should be especially grand. The GNTB is making the anniversaries of the fall of the Wall and German reunification at the heart of its international sales and marketing activities for 2014 and 2015. “25 years on from the fall of the Wall, we are presenting Destination Germany from 25 exciting new perspectives,” said Hedorfer.